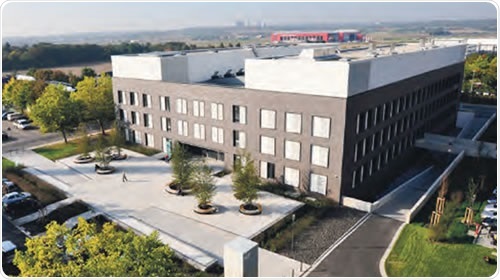 The Institute of Molecular Biology (IMB) is a center of excellence in life sciences located in Mainz, Germany (Figure 1). The IMB conducts academic research on epigenetics, developmental biology and DNA repair in order to gain insights into human evolution, aging, adaptability to the surrounding environment and the development of diseases like cancer, with globally acknowledged research. The IMB is situated in an advanced laboratory complex, with 160 employees, which include renowned experts in the field of microarray analysis, high-end microscopy, histology, cytometry, bioinformatics and next-generation DNA sequencing. Panasonic’s ultra-low temperature -86ºC and -150ºC freezers, featuring water-cooled condensers were chosen by the IMB to equip its key facilities in order to ensure superior performance with minimal operational costs and optimal sustainability. Various kinds of biological materials are being studied at the IMB, including human protein clones, tissue samples and human cell lines. Ultra-low temperature storage is required for these materials before nucleic acids and proteins are extracted to perform subsequent research. 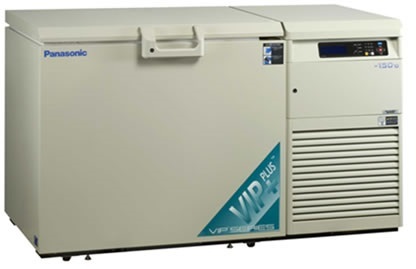 Highly reliable, secure storage freezers, with superior performance are essential for these important, often irreplaceable samples to be able to perform medically and scientifically important analyses. Minimal resources and lower energy consumption were the objectives behind the design of the IMB facilities. Therefore, in order to improve efficiency and lower costs, water cooling is used in place of conventional air cooling in most of the equipment, including sterile work benches, laser systems, centrifuges, and freezers. Moreover, resources are shared between different users from various research groups for optimized equipment utilization. Four Panasonic MDF-C2156VAN -150ºC cryogenic freezers (Figure 2) and 25 Panasonic MDF-U74V -86ºC ultra-low temperature freezers (Figure 3) were selected by the IMB for ultra-low temperature storage of samples. The central water cooling system of the IBM and an optional water-cooled condenser are featured in all of these freezers. Over 25,000 different human protein-coding clones are stored using the 728 litre, compact, optimal energy-efficiency, -86ºC ultra-low temperature freezers. Human cell lines, tissue samples, and tumor cell lines are stored in large numbers using the 231 litre -150ºC cryogenic freezers. IMB’s former Director of Core Facilities and Technology, Dr. Korn found that a highly reliable environment without any temperature fluctuation is what makes the Panasonic freezers attractive. Temperature fluctuation is minimal while opening the freezer, owing to the insulated inner doors, and adequate space is available to accommodate boxes. 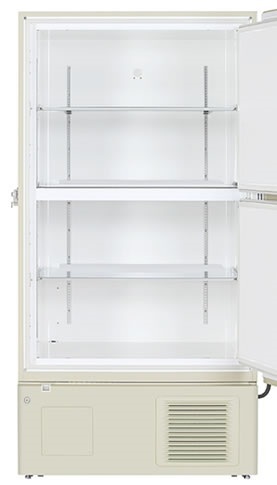 Each research group has its own storage needs, and all of the requirements can be fulfilled with a wide selection of shelving arrangements available. The easy-to-operate freezers have the main power switch on their sides, thus eliminating the risk of turning off the unit unintentionally. This is a common risk of having the power switch on the front panel. Figure 3. 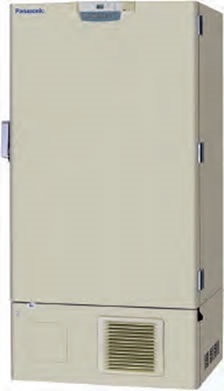 The Panasonic MDF-U74V -86ºC ultra-low temperature freezer. This has now been replaced by the MDF-U76V. A very compact design, improved energy efficiency, and superior temperature uniformity are the advantages of the Panasonic freezers due to their VIP insulation over traditional insulation. A specifically engineered cascade refrigeration system and Cool Safe® compressors are featured in Panasonic’s MDF-C2156VAN -150ºC freezers (Figure 4). These compressors are application specific, and have lower heat output, decreased compressor temperature, and prolonged service life due to advanced refrigerant feedback processes. The presence of an innovative capillary tube heat exchanger in most of the Panasonic ultra-low temperature freezers enables them to have superior overall efficiency. Moreover, the optimization of the available heat exchange areas increases system reliability and lowers energy consumption. The water-cooled condenser option (Figure 5) provides a chilled re-circulating water system to laboratories such as the IMB, thereby improving the overall energy-efficiency of these freezer facilities by reducing their air conditioning requirements and re-using the heat energy somewhere else. Heat exchange has to be effectively taken place at different refrigeration stages in order to achieve the required ultra-low temperatures. The key component in the heat exchange process is the condenser cooling the hot, high-pressure refrigerant to a liquid. There is loss of heat energy by releasing into the environment in the case of air-cooled ultra-low temperature freezers, thus necessitating the use of an additional energy for air conditioning the building for the removal of the heat energy. The temperature within the room increases rapidly in case of failure of the air conditioning system for any reason. 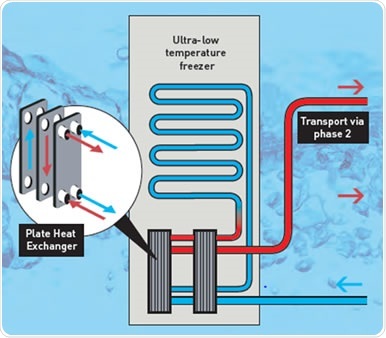 The presence of a double plate heat exchanger in the Panasonic water-cooled ultra-low temperature freezers enables optimized heat transfer between the refrigerant and the closed water circuit. The improved compressor efficiency owing to the more efficient heat removal by water than air enables the water-cooled ultra-low temperature freezers to consume 15-20% less power than equivalent air-cooled versions. The water-cooled approach allows for additional savings by further reducing the load of the air conditioning system. The heat removed by the water cooling system can be re-used for other tasks within the facility, for instance, heating the building or heating water for hand washing. As a result, energy costs across the facility can be reduced further. Improved sample preservation and optimized freezer performance are the other benefits that can be realized using the water-cooled system in addition to financial and environmental benefits. Further, pull-down time is reduced by up to 40% due to the superior water cooling capacity. As a result, temperature can be recovered rapidly during door opening, thus enabling better sample protection. Due to the heat release into the room being very small, the room temperature will not rapidly increase even in the case of failure of the air conditioning system. 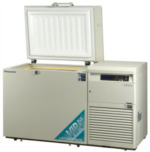 Consequently, the freezer provides improved sample security by operating reliably. Dr. Korn found that ventilation is enough because of the dissipation of small amounts of heat into the freezer room, reducing energy consumption and heat wastage by eliminating the need for air conditioning. The temperature of water circulation is 18ºC and the temperature of the water leaving the freezers is in the range of 23–24ºC. The warmed water is re-used for central heating of the whole building. Active cooling is required for fewer measurement rooms and laboratories as water cooling is available to over 100 instruments across the IMB, thus enabling the IMB to be energy efficient and environmentally friendly. The IMB also optimizes efficiency by running the instruments and equipment at their capacity limit. By placing the Panasonic freezers in a dedicated area, a centralized monitoring and alarm system can be effectively used to observe power supply, temperature and cooling water for all instruments. An optional hybrid water cooling system has been introduced by Panasonic for its Eco Series freezers, such as MDF-DU300H, MDF-DU500VH (Figure 6) and MDF-DU700VH (Figure 7), providing better sample protection by enabling the freezer to run using an air-cooled condenser in case of failure of the water cooling system. As a result, samples are continuously protected even under such exceptional situations. For facilities featuring a re-circulating, cooled-water circuit, it is ideal to have water cooling, as it offers better sample protection, superior performance, greater energy savings, and lower environmental impact. Dr. Korn remarked that the initial cost of the optional water-cooled condenser is higher than equivalent air-cooled freezers, but IMB is able to save significant costs by lowering energy consumption in the medium and long term using the water-cooled system. The freezer installation process was a turnkey experience for the IMB. After the arrival of the freezers, they were connected to the cooling water, turned on, and started working. The superior service and full guarantee offered by EWALD Innovationstechnik GmbH, the German Distributor of Panasonic, is another key factor for the IMB. 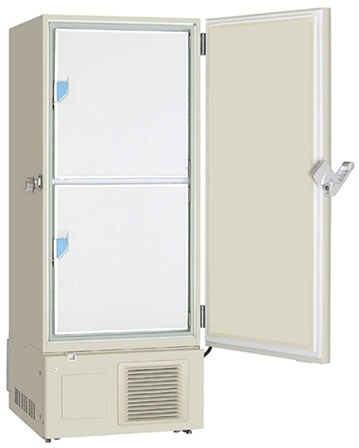 Besides having the recognition for providing better quality and reliable laboratory freezers, Panasonic also provides outstanding technical support and builds good customer relationships.